Though technology and data analytics alone cannot transform an institution’s student success initiatives, if they are widely adopted and deeply integrated at a strategic and tactical level they can make a big difference. The application of analytics in higher education has the potential to transform traditional student success work. In our own case, in September 2014, Middle Tennessee State University (MTSU) launched the Education Advisory Board’s Student Success Collaborative (EAB SSC). This was a part of MTSU’s Quest for Student Success, a strategic plan to increase student completion rates. Within four months of the launch of this platform, along with other key strategic initiatives, we were able to achieve record persistence rates (ie, the percentage of students who start in the fall semester and return for the spring). These early results were striking. Our analysis suggested that if MTSU had continued to do business the old way—without predictive analytics—we would have had 390 fewer students. This performance differential netted MTSU an additional $1.5 million for the spring 2015 semester alone! Since the launch of its Quest for Student Success, MTSU has continued to experience record levels of success in virtually all of its primary student success measures. Two illustrations are contained in the charts below. 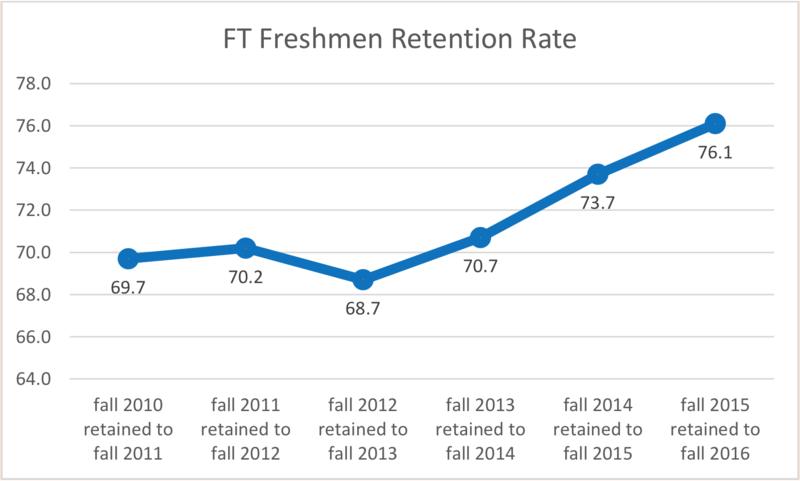 As noted in figure 1, in fall 2013 MTSU’s freshmen retention rate was 68.7 percent. By fall 2016 the freshmen retention rate had increased to 76.1 percent. Significant increases have also been attained for progression rates, the percentage of freshmen completing 30 or more hours in their first two semesters of study. A total of 42.2 percent of freshmen entering in fall 2013 completed 30 or more hours by the close of the spring 2014 semester. 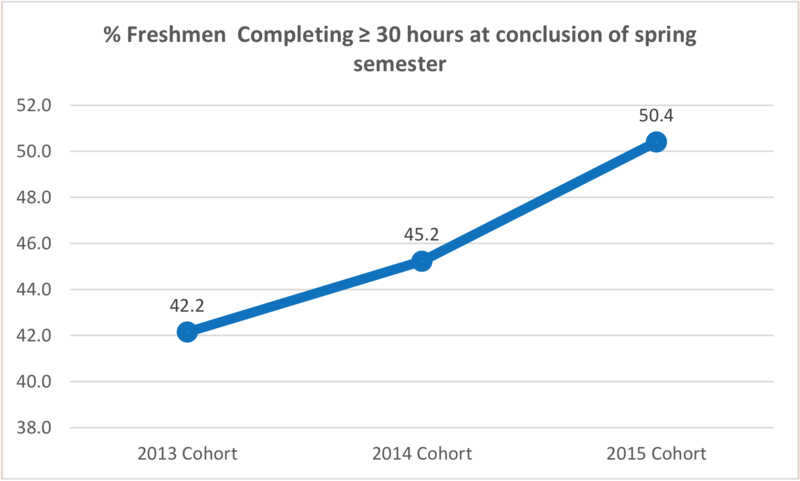 However, 50.4 percent of freshmen entering in fall 2015 had completed at least 30 hours at the close of the spring 2016 semester. At MTSU, more students are both staying in school and making progress toward timely degree completion. How are results like these possible? The wrong answer would be, “because of predictive analytics.” A more correct answer is that predictive analytics, employed as a tool widely, strategically, systematically and as a part of a carefully devised and coordinated completion initiative, has the potential to transform student success work. Predictive analytics are simply a tool and, importantly, only one part of a comprehensive student success plan. We’ve seen schools who have made analytics available on campus, but who have seen few, if any, changes in student success outcomes. Why is that? There are many explanations, but two stand out. 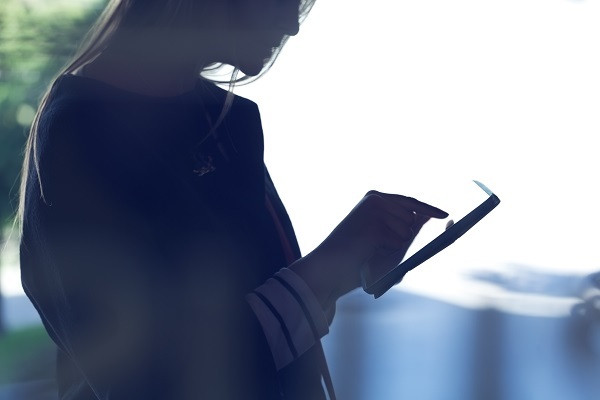 First, although often characterized as a solution, analytics are only a tool. Second, perhaps more importantly, there are more than a few schools who have purchased analytics platforms, but their adoption across campus has been quite variable. It is not uncommon to find that at some schools, entire colleges, or even individual advisors on a college campus do not fully adopt or leverage analytics-based advising platforms once launched. It is one thing to know the most predictive courses for the university or individual programs. But once known, the key is ensuring that this information is used to inform strategies and planning. 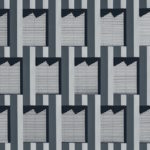 Examples include redesigning courses, curricular sequences, or creating learning communities (ie, linked courses) for certain students or in particular programs. In complex, often decentralized university environments, getting everyone to adopt and apply new technologies is difficult. But case studies are clear: Campuses that adopt these technologies institution-wide experience the most profound outcomes. When a campus acts intentionally with a unified effort, the power of this alignment makes a difference in student success initiatives. The great work of the Community College Research Center highlights an essential ingredient of high-producing student success initiatives: multi-level engaged leadership. Indeed, even the most visionary college president cannot advance student success unless all leaders in the hierarchy—including vice presidents, deans, chairs and directors—are truly involved and assume ownership of the initiative. 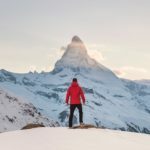 Everyone in the hierarchy enjoys a personal responsibility to not only work together collaboratively, but also to ensure that their area actively supports whatever initiative is identified. A clear message should be communicated to staff that adoption and utilization of new technologies is not optional; it’s an expectation. When individuals or units undercut initiatives, it hurts the entire university. When new platforms are launched, it is particularly important to continuously assess utilization, whether staff are accessing the technology. As implementation of the technology matures, the focus shifts to how the technology is being applied. The leadership of first-line managers is very important in new technology launches. 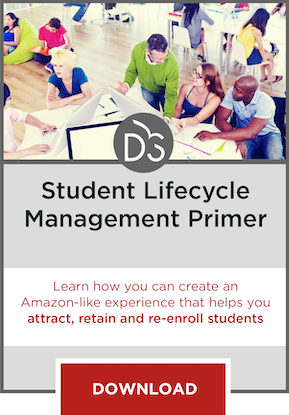 On our own campus, advisor managers astutely set workflow practices in place so that utilization of a new advising platform became a habit, rather than an add-on. Someone at the university has to lead the initiative to introduce new technology. A well-worn adage in our space is, “when everyone on a campus is responsible for student success, no one is accountable.” The same principal holds true for the implementation of new technologies like predictive analytics platforms. Although several units work interdependently in the launch of new technologies, the identification of a point person to work across the institution is necessary to serve as a cohesive agent in leading the initiative. At MTSU, the Vice Provost for Student Success was assigned this responsibility, but his work with ITD and student records was seamless, with all three areas functioning in a “one university” model to ensure a smooth and timely launch. In the implementation of any new software platform institution-wide, there will be complications. 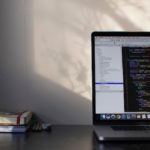 Without exception, some program features probably won’t work correctly, there may be data flaws, and new users can experience any number of complications. Someone at the ground level has to be assigned the responsibility of tracking reported problems, monitoring issues reported to the vendor, interfacing with IT, and communicating with end users about resolutions reached (or not). Unresolved glitches or data integrity questions quickly undermine user confidence. At MTSU, as described below, a very capable faculty member assigned to the student success office worked tirelessly to track and seek resolution to every reported problem. Handled in this fashion, user confidence in the system grew strongly, with even the strongest critics becoming allies. If we want faculty to use new software platforms, there will need to be someone assigned to work with them who speaks their language, understands their work, and has their confidence. At MTSU a faculty member with leadership aspirations was appointed as an “administrative fellow” in the office of student success. Our administrative fellow exceeded all expectations in serving both faculty and staff in the launch of our new predictive analytics software system. A strong student success vision statement is a powerful force in guiding the adoption of new software platforms, including predictive analytics. MTSU’s vision is, in part, to “become a national thought and practice leader” in student success. This aspiration has guided us in so much of our work, including the launch, utilization and application of new technologies. In closing, the important work of our faculty and staff cannot be over-emphasized in all of our student success endeavors, including our adoption of new software. I am reminded of what we regularly refer to as the “70/30” equation on our campus. Explained simply, we reflect frequently on the idea that 70 percent of our student success work is achieved through people, 15 percent by process, and 15 percent through the application of technology.